Educators are always looking for ways to connect student learning to the authentic world. If technology can somehow aid or enhance the ability to create these real-world connections, than learning is being extended outside of the classroom walls and into student's everyday lives. In addition, another piece of extension are non-content related skills (often called "soft skills"). In the digital age, educators are often looking to help their students to start developing grit and P21 skills, that many employers are asking for. In order to measure if technology tools are extending learning goals, the following questions can be used for analysis. *Click here to see examples of instructional strategies that can be employed to help elicit extension when using the digital tool. The research below highlights the research that informs the Triple E component for extension. Researchers believe that technology tools need to encourage meaningful learning, where the technology is extending the learning from student’s preexisting knowledge and helping them create new knowledge (Wartella, 2015). 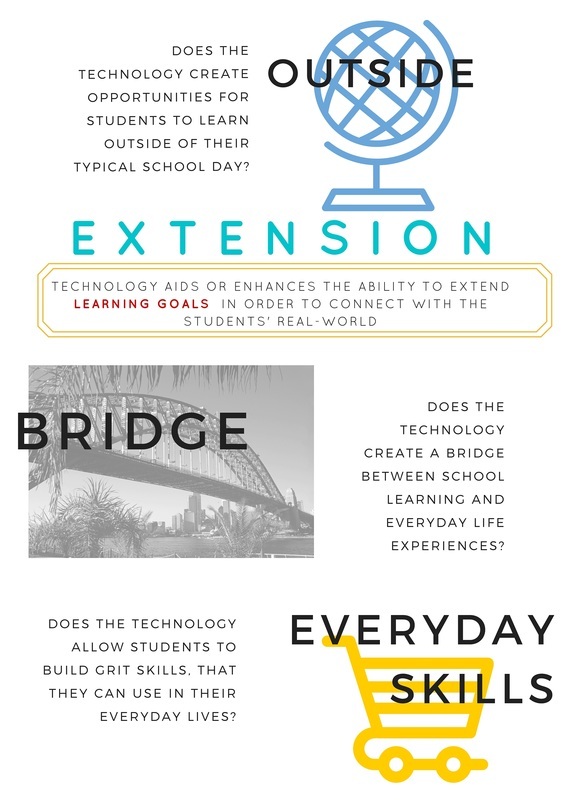 Does the technology create a bridge between school learning and everyday life experiences? Students learn to use to technology to connect with other people that are different from them, learn from them and share what they know. Does the technology allow students to build skills, that they can use in their everyday lives? Students are learning to use digital tools to build positive digital footprints and make new friends.